The space in the bedroom is never enough, but that’s even a bigger problem when the bedroom is compact. And of course, we must find some space for a makeup vanity, and this is sometimes the mission impossible. But do not lose hope! Here we’ve got the 15 of the best and coolest vanity ideas for a small bedroom. We’ve got built-in, floating, illuminated, not illuminated, angular, retractable vanity and many more! You’ll find your favorite one for sure.Some of these ideas are cheap ways to decorate a teenage girl’s bedroom. 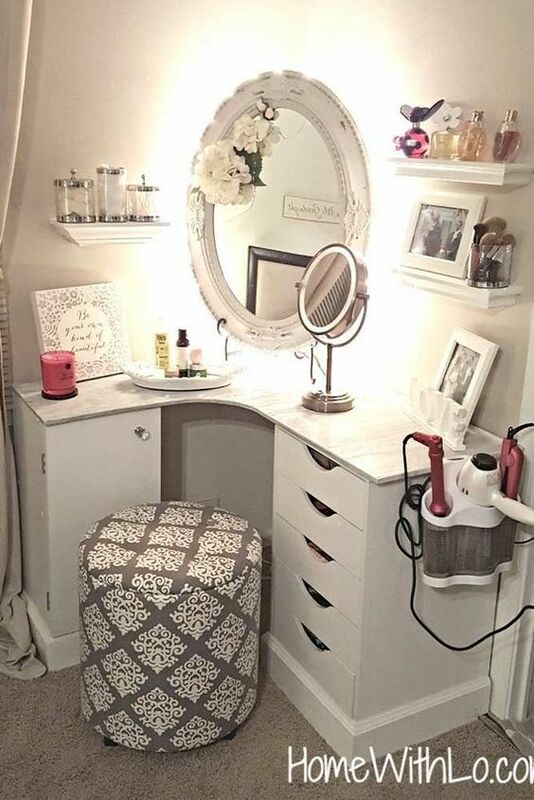 Here is one of my favorite vanity ideas for the small bedroom. 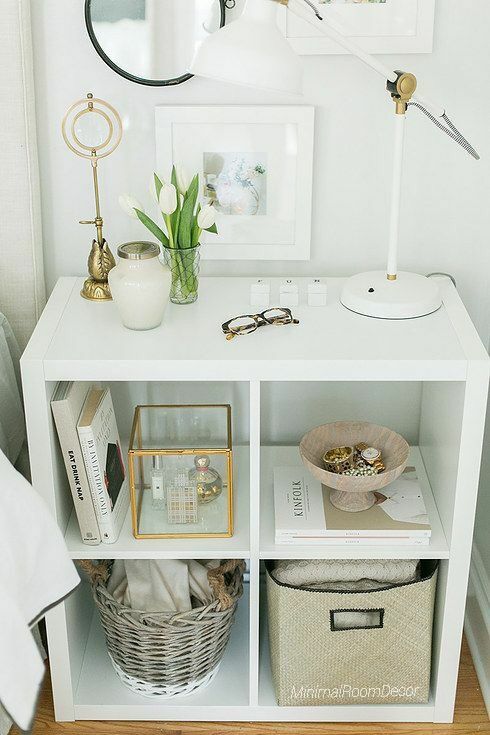 The white color is seriously needed for bringing a pure positive vibe to a small bedroom. 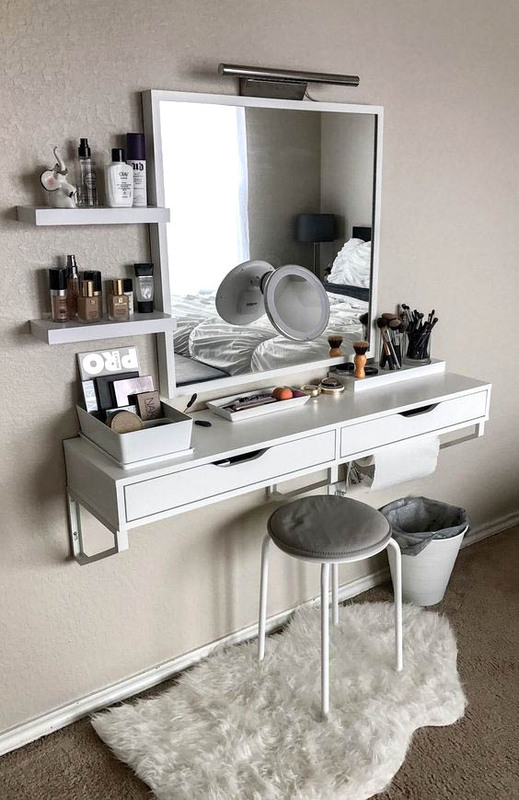 It’s a pretty simple and, yet, stylish and effective vanity. You can install it no matter what the color of your bedroom is – white goes perfectly with any color. Lining the mirror with lights is a great idea to make the small bedroom look larger. The pastel tones and the fluffy rug add some tender girly vibe to the overall design. You can replace pink with turquoise which is ultra modern these days. 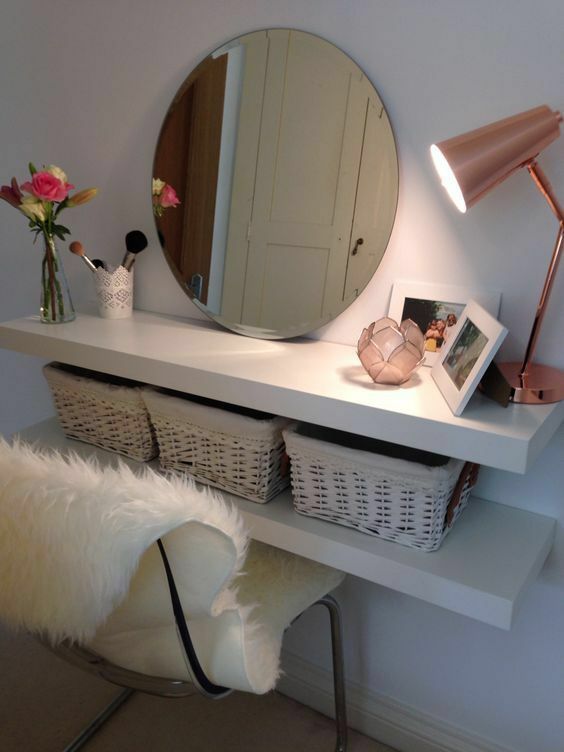 When you are on a budget, you don’t necessarily need to give up your dreamed vanity idea. Go to the nearest Antique store and find a nice mirror, some photo frames, and an old chair you can either transform or upgrade. The white floating shelves could be found at the local home and garden store or IKEA. 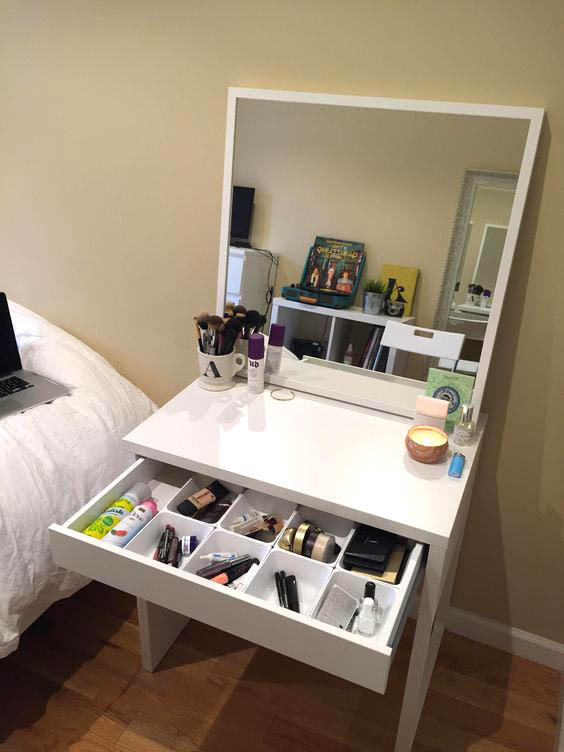 If you are searching on the internet, you may see tons of IKEA vanity ideas. This one, for instance, is a nice, beneficial Scandinavian one. The best part is that it could be used as a nightstand and a makeup vanity at the same time. If you don’t know how to search for this vanity, just ask for cube storage. 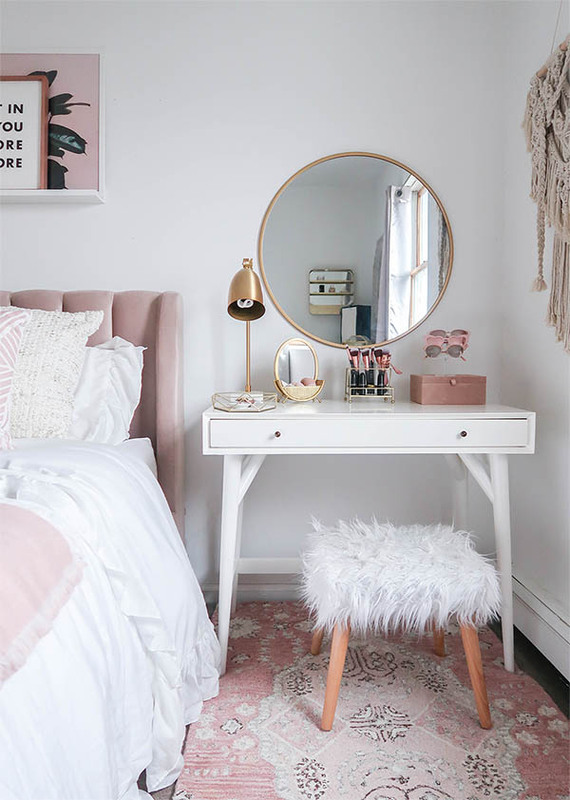 Here is the ideal mini desk that fit in the non-spacious bedroom, and has the potential to be transformed into a vanity just by adding a mirror (as shown on the picture). The white and the Roses ashes color complement each other. You can put the chair beneath the desk and save some more space. Women are usually living in a house full of girly stuff. And the lack of space could be a problem! 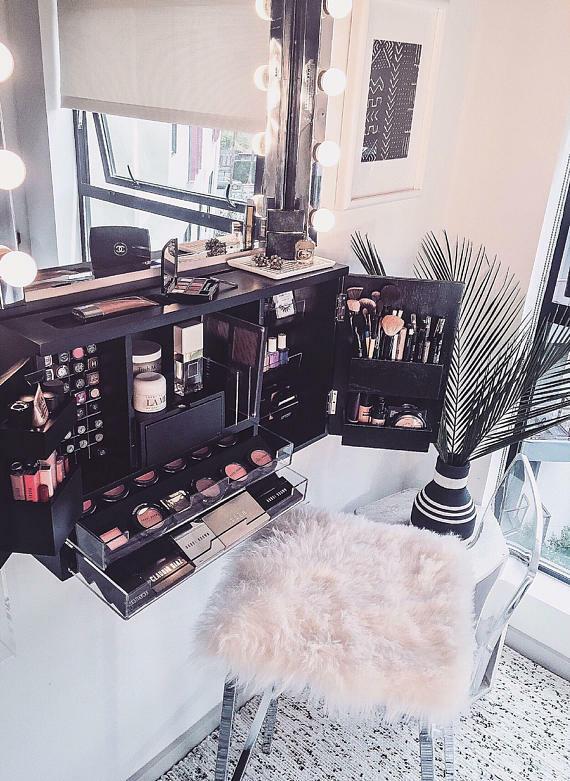 This particular vanity drawer would help you find enough space for all your makeup. I’m not sure, but may be there is an option to remove the mirror and use this as a desk only. Here is something else to add to your list with vanity storage ideas. It works as a dower-chest vanity and an auxiliary table at the same time. You can basically close it and use it as a table. The tiny shelves (on the left) are part of the vanity set up and are full of beauty must-haves. 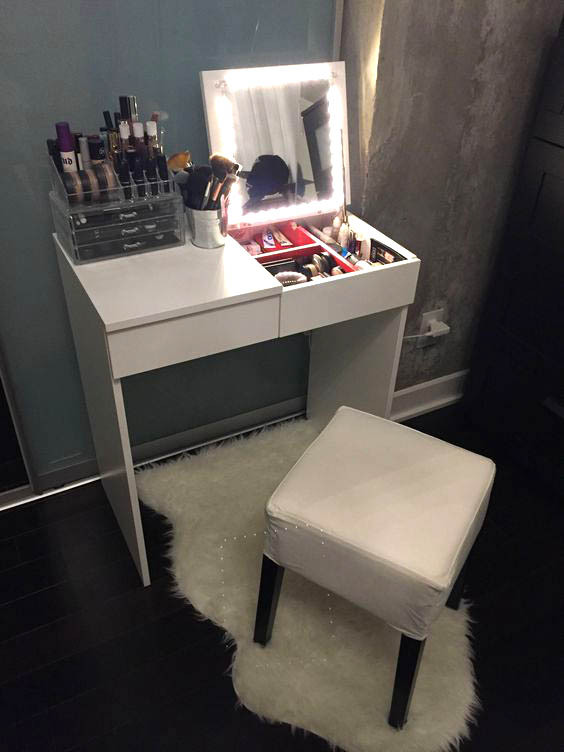 The built-in lighting gives you the ultimate make-up spot. Here is another proof that lights can really transform a room into something magical. This simple elegant black vanity storage has been jazzed up with astonishing mirror lights and a fluffy faux fur chair rug. 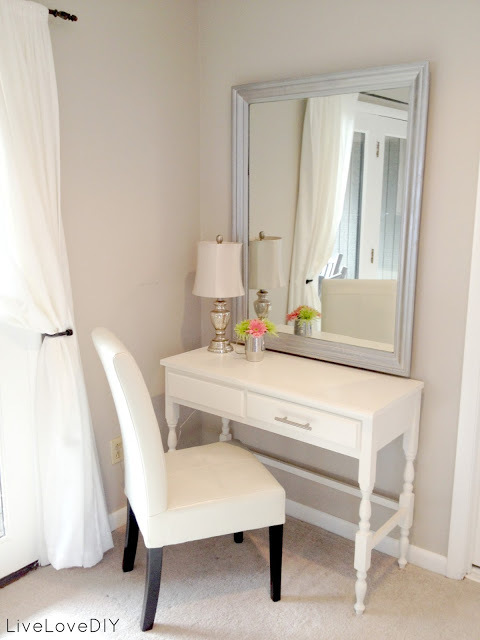 I simply love this cute personalized vanity and vision board in white. They turn the small bedroom into a nicer, cozier space. The mirror lighting with frosted LED light bulbs adds a dramatic touch to the overall design. 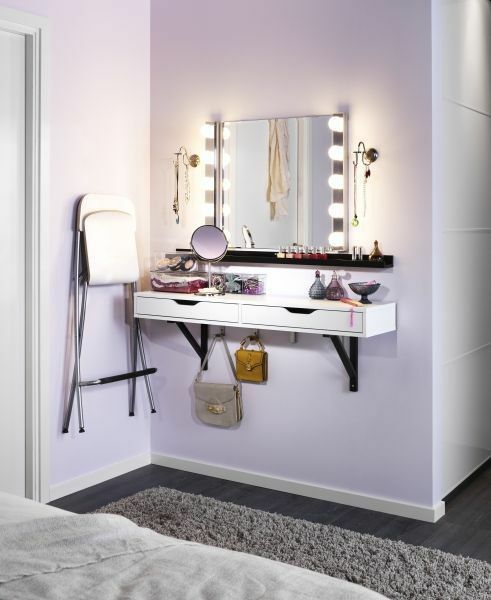 This vanity is not just a space-saver but it’s also very practical as it gives you the chance to see all your makeup. Let’s face it – if you don’t see it, you won’t use it. If you prefer to hide them you can always use a cover. Materials needed: Ekby Gruvan shelf; Godmorgon box; Gilbert stool; Vika Curry legs; Kolja mirror. 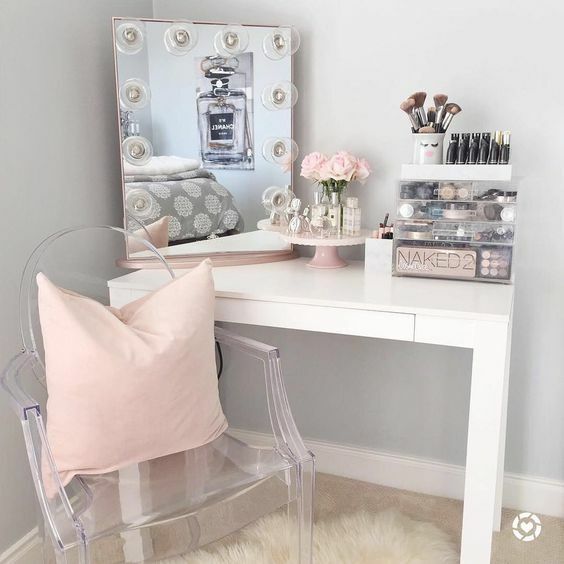 If you’re a fan of the appealing and feminine decor then consider a white vanity with some baby pink color accents like this one. The pink is very chic and pairs well with white, gold, and grey. The crown in the center is the fabulous finishing touch. This cute vintage vanity is like a female fortress – it has everything a woman needs to feel beautiful and attractive. There are tons of drawers and tiny shelves so it won’t be that big deal to fit all your stuff. All of your electrical tools are easily stored beside the drawers. The alternating drawers in black and white are set in black framework giving a dramatic touch for the room. Also, take a look at the angled 3-piece mirror with LED lighting – it’s great for applying makeup. Pink and purple teenage girl’s bedroom is a evergreen trend. Can you believe that this beautiful chair was bought in a thrift store? And this beautiful vanity table at the flea market? In fact, you can turn something old into something stylish without hitting the mark. I was searching for some DIY makeup vanity ideas when I found this one. You don’t need to necessarily buy all the elements together, you could buy them separately. This vanity is created with a table with drawers and a funky frameless mirror. A setup like this could be created with any table and mirror. This way you can have a vanity that fits your own style and taste. 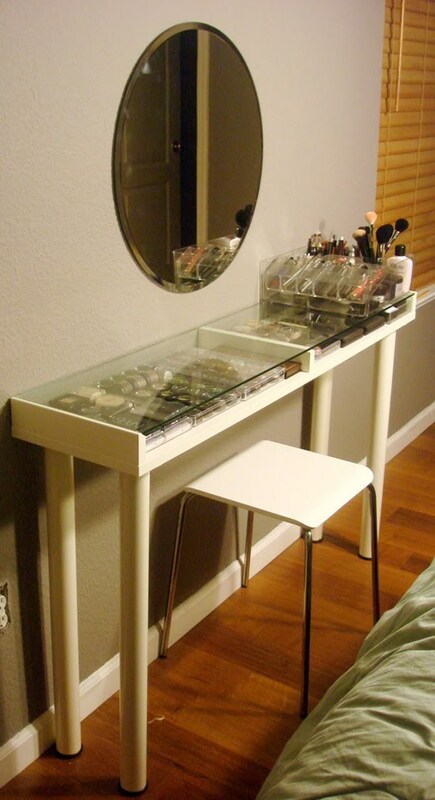 By now you should have chosen the perfect vanity for your bedroom. Even if your bedroom is not very small, these ideas could save you a lot of space which you can use as per your desire.